Lightning appears to be the cause of an oil field fire in Kilgore, TX. A lightning strike was the cause of an oilfield fire Saturday in Kilgore, TX. 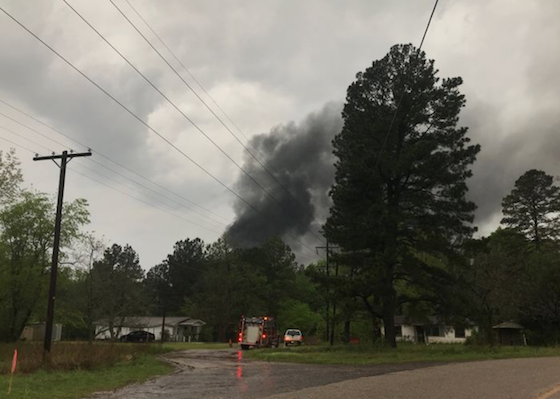 About 5:40 p.m. Saturday, Kilgore Fire Department and Sabine Fire and Rescue firefighters responded to a fire on Watson Road in Kilgore. Before firefighters hit the scene, large plumes of black smoke were visible. A tank battery was struck by lightning, said Sabine fire officials said. One of the tanks caught on fire. Mud and high water have prevented firefighters getting equipment close to the flames, officials said. The fire has also melted power lines hanging near the tanks, according to the Sabine fire officials.